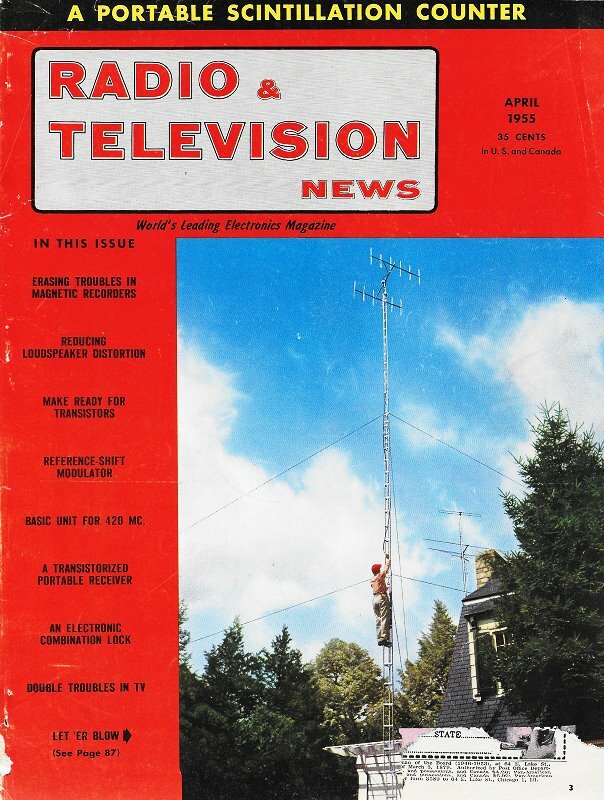 This story in the April 1955 issue of Radio & Television News might be the first public disclosure of Bell Telephone Laboratories' flexible waveguide design. Operating at 50 GHz, the new waveguide will replace hundreds of existing coaxial cables that can each carry only 600 telephone channels and two television channels. It can also increase the distance between amplifiers from 12 miles to 50 miles. Construction consists of a hollow flexible tube lined with a spiral winding of copper wire. Incidentally, the lower cutoff frequency for circular waveguide with a 2-inch diameter, as reported here, works out to around 1.8 GHz. I was skeptical about the claim of operation at 50 GHz since that kind of spectrum was the domain of laboratories back in the day, not commercially deployed systems. 2 GHz was doable, so the new waveguide accommodated existing technology as well as future expansion. One thought that occurred to me is that the story mentions coaxial cable bundles that included spares for backup in case one or two went bad. The waveguide represents a single point failure with no redundancy unless a dual run was made for each installation. This hose-like tube is the new Bell long-distance wave guide. Unlike standard wave qui des it can carry signals around curves. 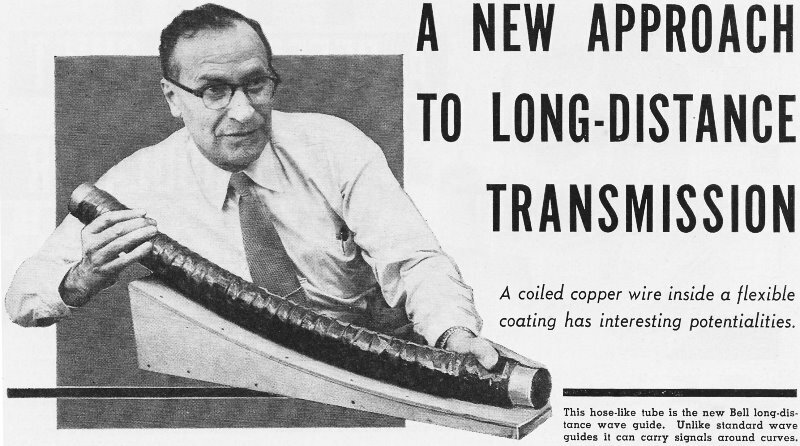 A coiled copper wire inside a flexible coating has interesting potentialities. Bell Telephone Laboratories has developed a new and radically different medium for transmitting television and telephone conversations over long distances. 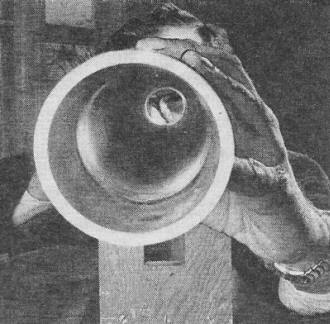 The new medium, a long-distance wave guide, is radically different from modern cable or radio relay systems in that it uses a hollow metallic tube roughly two inches in diameter. Scientists at the Lab believe that this new unit may someday carry tens of thousands of cross-country telephone conversations and hundreds of television programs simultaneously. By contrast, the top capacity for the most modern coaxial cable systems is 1860 two-way telephone conversations or 600 telephone conversations and two TV programs simultaneously on a pair of coaxial tubes. Modern coaxial cables have eight such tubes, two of which are kept as spares for emergencies. Length of the experimental wave guide. It is of flexible copper and approximately 2 inches in diameter. Carrier frequency is 50,000 mc. 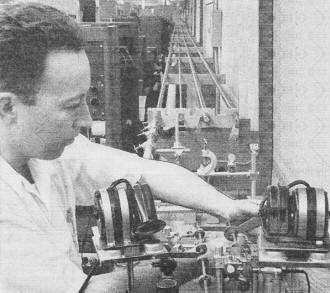 A Bell Labs engineer tests transmission through the new wave guides of various sizes. The 2-inch diameter was found to be the best. Wave guides made of solid metal tubing have been widely used for some time for short distances. It would be possible to use these solid metal tubes for long distances if they were perfectly straight, but this is impractical. The new long-distance wave guide is also a hollow tube but it is constructed of a thin copper wire, very tightly coiled and wrapped inside a flexible outer coating which holds the coiled wire in place. This type need not be straight and can actually carry signals around corners. 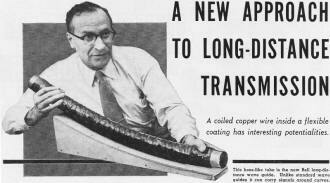 Although this new form of transmission is still in the experimental stage, a recent long-distance test was made at Holmdel in a copper pipe 500 feet long. Engineers bounced signals back and forth in the tube for distances of 40 miles. They calculated that in comparison, the same waves could have traveled only 12 miles in a coaxial cable with the same loss in strength. The new transmission system operates even above the "super high" band of 30,000 mc. The carrier frequency for the new wave guide is about 50,000 megacycles. A major difference between transmission through the new wave guide and through previous systems is that the higher the frequency in the wave guide, the less the loss through attenuation. This is exactly the reverse of other forms of transmission. Beyond the prospect of an improved transmission with the long-distance wave guide is the possibility of learning how to use tiny wavelengths on the order of one millimeter, about 125th of an inch. If this should become possible, the wave guide of the future may be no thicker than a fountain pen and still carry tens of thousands of telephone messages. As a result of this experimental work, the engineers hope to use the new wave guide in a variety of ways. One such application might be with a heavy protective coating so that the hollow tubes can be run underground which would put them out of sight and out of the reach of the elements. This latter consideration offers possibilities of reduced maintenance cost and even better service.